From the bottle, it pours a hazy light amber with a large, thick head. In the nose, it has some light citrus. In the mouth, it is a lightly bitter in the mouth - almost a pale ale bitterness. Juicy, hoppy, floral, slight bitter on the finish. But super suddsy. Almost soap like. Takes away from the beer overall. Wouldn't revisit this one again. This IPA is just not that good. It lags way behind excellent IPA's like Stone and Sculpin selections. I left behind most of a six pack at my in-laws. Pours a hazy golden color. One inch head of a white color. Great retention and decent lacing. Smells of floral hops, citrus hops, slight citrus, slight sweet malt, hint of piney hops, and a hint of alcohol. Fits the style of an American IPA. Mouth feel is sharp and clean, with a high carbonation level. There is a pleasant lack of bitterness. Tastes of floral hops, citrus hops, slight citrus, slight sweet malt, hint of piney hops, slight grass, and a hint of alcohol. Overall, good appearance, too carbonated, but bitterness if well blended, and good complexity. Bright, light amber body; huge sculpted head of foam; some rings of speckled foam layer the inside of the glass. Zesty, peppery aroma; some heavy malt sweetness. Little malt flavor at first sip, but a fruity and spicy hop presence develops fairly rapidly; good hop bitterness build up. Medium body; rather slick and watery at first yet there is some fiery qualities from the hops. Beyond IPA burn out these days for me but this one is not bad, but that simply puts it right up there with a boat load of others. 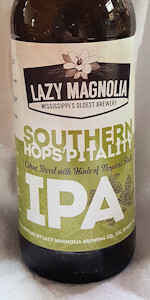 Tried a six pack while on business trip to Meridian, Ms. has a nice citrus/floral smell. Good flavor. This beer pours a bright amber red color with a two finger, fluffy bright white head. Retention is moderate for they style and there are some whispy spots of lacing left on the glass. Smell is pine, earthiness and citrus hops along with some sweet caramel and bready malts. When the beer is agitated the fruity flavors of grapefruit pith, tangerine and mango really come to forefront. Taste is the same, but the malts are a bit more present. The only hint of the fruity flavors comes right at the beginning because first the sweet malts come in and then there is a solid bitterness that comes through mid sip and really wipes out all the other flavors. Feel is light and smooth, but lacking carbonation. There is a bit of stickiness on the finish from the hops. Overall this beer is decent. A solid example of the West Coast IPA, but it is a bit too malty for my liking, especially for such a low abv beer.